The University of Wisconsin men’s hockey team (8-10-4, 4-4-4 Big Ten) continued their challenging Big Ten schedule Friday and Sunday as they faced No. 12 Notre Dame (13-8-2, 6-6-1), the third-ranked team in the Big Ten. 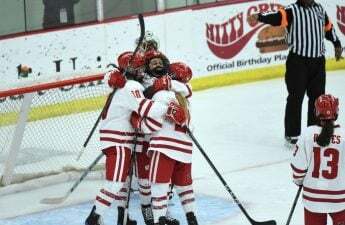 The Badgers dropped the first competition 6–4 at the Kohl Center, a place they have had considerable success this season, before drawing the second competition 2–2 at the United Center in Chicago. The Irish ultimately secured the extra point in the Big Ten standings Sunday by winning the 3-on-3 overtime period. Despite the results, this young Badger team proved it can keep pace with a top-ranked team as it continues to improve down the stretch. Friday’s game was a competitive one, with the score tied at three entering the final period. 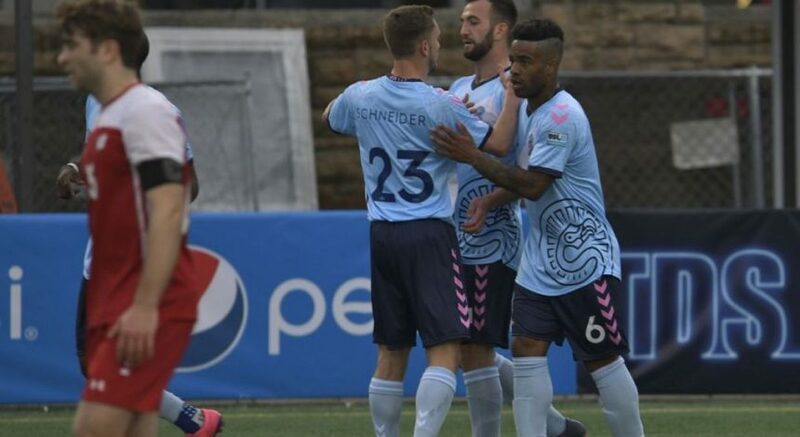 The Badgers put together one of their best offensive nights of the season thanks to goals from K’Andre Miller, Will Johnson, Roman Ahcan and Tarek Baker, but fell short due to two Notre Dame goals in the final 13 minutes of regulation. Friday’s game was memorable for goaltender Daniel Lebedeff. Despite allowing six goals to the visiting team, the freshman’s assist to Miller on a UW power-play marked the first assist by a Wisconsin goaltender since Dec. 2012. Miller’s goal added to his team-leading 18 points in only 20 games played. After the game, Head Coach Tony Granato praised the performance of his team. Friday’s game marked the first time since Oct. 27 that the Badgers netted multiple power-play goals. Wisconsin has struggled on odd-man advantages this season, so their breakthrough Friday was a positive sign heading into Sunday’s rematch in Chicago. The Badgers got off to a strong start Sunday, scoring two goals in the first period — one coming from sophomore Roman Ahcan with one second left on the clock. After the first period, however, the Badgers were unable to capitalize on offense and ended up drawing the contest 3–3. 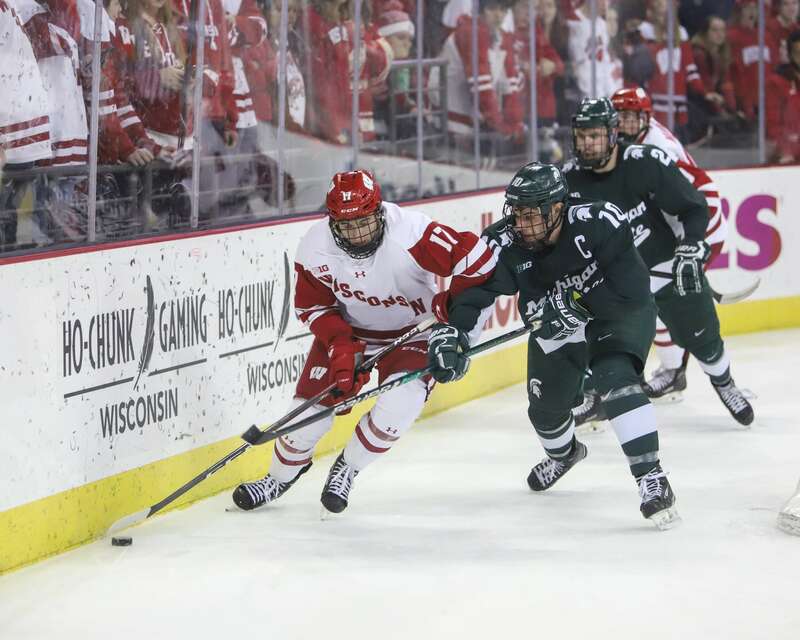 The Badgers’ power-play struggles continued yet again Sunday — UW failed to capitalize on five power play opportunities, while the Irish netted one power-play goal on just two advantages. Much like Friday, the Badgers came out fresh but were unable to find the back when they needed it most. The Badgers finished with 35 shots on goal — 19 coming in the second period — compared to 30 from the Irish. Despite failing to gain a point in the overtime period, Granato was pleased with how the young Badgers competed against one of the best teams in the country. For the players, it was a memorable experience playing in the United Center, the home of the Chicago Blackhawks. Senior Peter Tischke, a Chicago native, explained how he felt playing on his favorite team’s ice. The Badgers hope to bounce back this weekend as they travel to Minneapolis to take on the University of Minnesota Friday. Puck drop is scheduled for 7 p.m. for both games.